The roads to Hawk are many ... the destination, paradise. So, Which Way Are You Planning to Go? Driving up? Check out custom maps and step-by-step directions from numerous points of departure. Or, use Mapquest.com's map feature here to get additional directions. 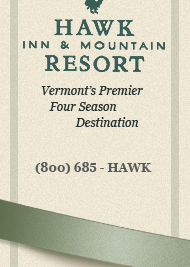 If you live in the Northeast and would prefer to start off your vacation by kicking-up your heels and letting Amtrak do all the work, consider riding the rails to Hawk on one of three daily departures to central Vermont. And if you live further away than ground transportation permits, or just want to get up here in a hurry, let us show you the numerous options available for taking to the skies and flying to Hawk. Airline and car rental links... they're all inside. Simply choose your desired mode of transportation and you'll be well on your way to experiencing blissful luxury at Hawk. For more information, or to make reservations, please call (802) 672-3811. Or click here for more contact information.